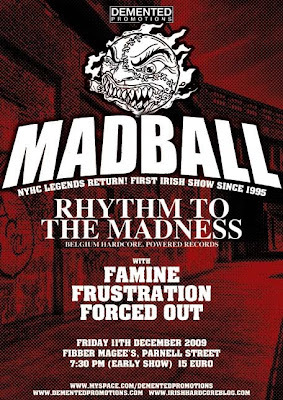 In a couple of hours I'm leaving for the airport to catch a plane and go on a little 24-hour visit to Dublin, where Rhythm To The Madness will be playing a show with New York City's legendary Madball. The only time I've ever been to Ireland was years ago when hiking through its plains for 10 days, during which every sign of civilication or human presence was carefully avoided. So I've never been to Dublin and neither has anyone in our road crew, and if you've been an avid Complex Man reader you know how much I love Madball. Needless to say we're all pretty psyched on this little trip! Besides seeing Dublin and watching Madball, we're looking forward to playing a show. It's been a while and this will be the last-but-one Rhythm To The Madness show, the final one being on February 17th in Antwerp, together with Floorpunch and our brothers in True Colors. But more info on that later. Or not.